Most of America was shocked when sideline reporter Erin Andrews interviewed Seahawks' cornerback Richard Sherman in the aftermath of his game-saving pass deflection in yesterday's NFC Championship Game. You could feel the adrenaline, passion, and violence coursing off his body as he brashly and threateningly proclaimed he was the best defender in the NFL and trash-talked 49ers receiver Michael Crabtree with whom he had tangled throughout the game. Actually, who am I to judge? I act just like Sherman at coffee hour after I preach a killer sermon. Fox sticks a microphone in Sherman's face AGAIN? Who's producing this fiasco? This was nothing compared to some of the racism (both subtle and overt) spouted off after the interview. The image of an angry, fired-up black man with dreadlocks standing next to an upper-middle class white woman with a microphone played into many people's darkest fears. Never mind that this played out on the eve of the Martin Luther King, Jr. holiday. Later, the Stanford-educated Sherman was much more eloquent but the damage to his reputation had been done. Of course this being sports in America, all will be forgiven and forgotten if Seattle wins the Super Bowl in two weeks. But I admit I'm complicit in this whole scenario. Not because of my tweets (and it's not as if I have that many followers) but because I'm an avid football fan. We expect our warrior/athletes to act like animals on the field and cheer them vociferously for it. Yet two seconds after walking off the field, we expect them to be transformed into model citizens. "Leave it all on the field" means more to us than playing their hearts out -- it means leaving the adrenaline-fueled violence out there as well. We cheer, adore, and financially reward football players who act like gladiators on the field and excoriate these same men when they display violent tendencies off it. It's no wonder that the two teams with the most suspensions for performance enhancing drugs this year -- the Denver Broncos and Seattle Seahawks will be playing in the Super Bowl. 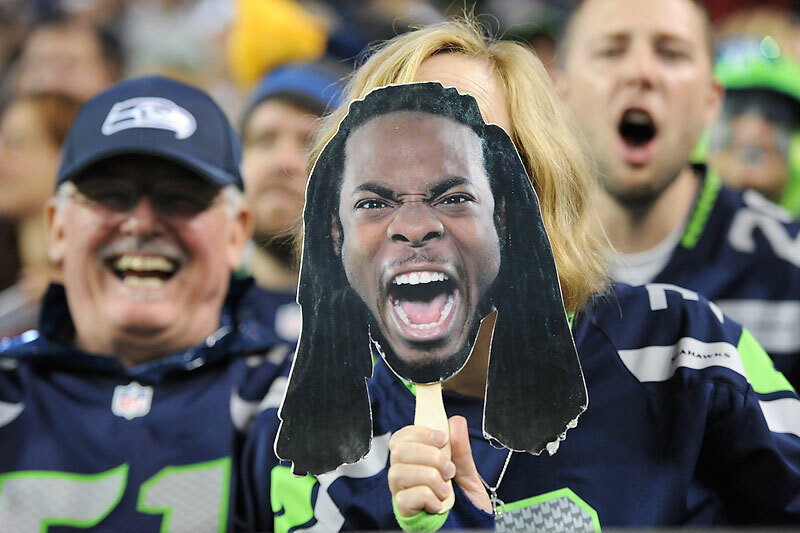 By rewarding and glorifying this behavior we are all complicit in Richard Sherman's response. It's no surprise to readers of this blog that I'm an avid football fan -- I even flew down to Baltimore with my two boys for last year's Ravens victory parade. But I admit the game is slowly losing its appeal. Every time I see a jarring hit I now envision the brain whipping around the skull. The acronym CTE (chronic traumatic encephalopathy) takes its place amid other familiar ones like TD, FG, and QB. While the NFL continues to be the most popular and profitable sports league in the world, the game is changing. I'm not sure what the future will hold for professional football but I do know that when we revile the actions of players like Richard Sherman, it's important to remember that we created the very monster we condemn. My issue with Sherman was wayching him constantly go up to the receiver he defended against and tapped them and say some thig to them during the game. Then he could not just glory in his greay play and speak to that when queationed. Why not show his fans good sportsmanship! Why call out another great athlete as something less? 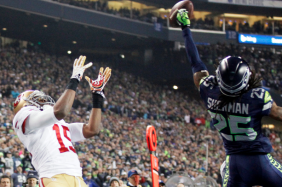 It really is a shame as Sherman is a phenominal athlete and now diminshed in my eyes. You identified the issues: no one goes from playing like that to a well considered interview with a reporter w/mic. I wish some of the reporters would back off. Also, the racial issue is always with us, early and late, getting and spending, we do lay waste our powers. Um, no. There are PLENTY of NFL, NBA, and MLB players who act civil and 'like they've been there before' during post game interviews. Did Peyton Manning throw a rant similar?